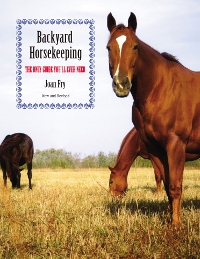 After my terrifying three-legged ride on Prim in the mountains, I could find only one book in my entire library of horse books that described her condition. Since it didn’t use the term dropped fetlocks, the index was useless. I had to look at all the topics listed under “legs.” The book is the revised and updated paperback edition of The Illustrated Veterinary Encyclopedia for Horsemen (the original hardcover came out in 1975 from Equine Research Publications), published by the Lyons Press in 2005 and now called Horseman’s Veterinary Encyclopedia. I highly recommend it. I found what I was looking for by reading about fetlocks, where I eventually encountered “Suspensory Ligament Injuries.” The authors discussed the condition in the context of race horses, and according to severity. The type Prim seemed to have was a “strained” ligament, and under the heading “What is the prognosis?” it had this chilling pronouncement: “strains that result in a sinking of the fetlock have a poor prognosis.” That’s exactly what was happening—one of Prim’s rear fetlocks was sinking. About six months later, both hind fetlocks had sunk to such an extent that both legs were straight, and both pasterns were more horizontal than vertical. The next time the vet came, she told me to continue the bute and mild exercise. 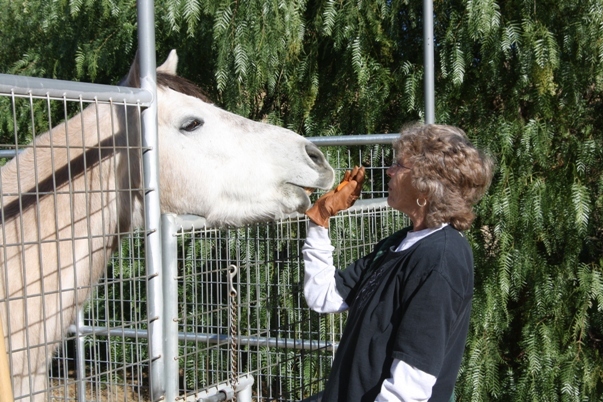 I told her my usual practice was to put Gunsmoke into the arena and walk Prim out of her corral and let go of her. (By now she was wearing a breakaway halter and a catch rope.) She would canter uphill, exchange sniffs with Gunner, and then roll. I noticed she was always very careful to roll uphill. She seemed to have no trouble getting to her feet again, and the vet said what she was doing qualified as “mild exercise.” Then she added, “You’ll know when it’s time.” I pretended I didn’t understand what she was telling me. Another vet—a friend, and he was simply volunteering his opinion—told me not to ride her again at all, that I was lucky she hadn’t fallen with me. I continued to feed her grass hay and let her out to walk around and graze every other day. I rode her only once after that. At first she seemed excited and happy. Then, when we passed out of Gunsmoke’s sight, she was excited and unhappy. 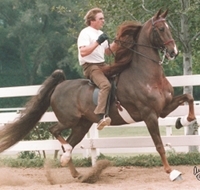 Instead of flat walking—which any horse, even an American Saddlebred, can be taught to do—she pranced. I debated getting off and hand-walking her back. 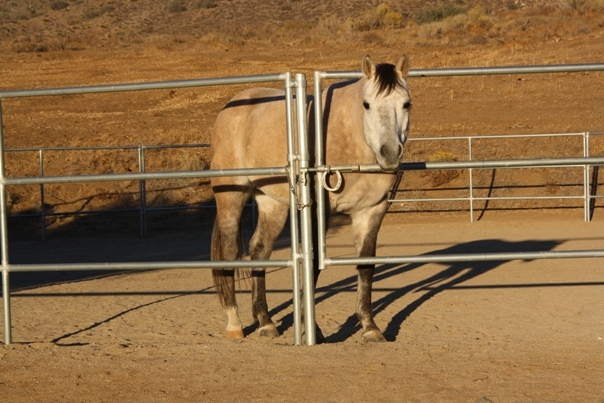 At a true “flat” walk, the horse has three legs on the ground, and if she can’t bear her own weight on one leg, she can still remain upright. What Prim was doing was a slow, animated trot, which meant she had only two legs on the ground (except for the brief moment of suspension), and the risk of falling was much greater. I compromised by taking both feet out of the stirrups in case I had to bail and tried to sweet-talk her into walking. But she pranced all the way home until she saw Gunsmoke. It was the last time I rode her. I put her down mid-summer, when it became obvious that the condition had begun to affect her front legs—she was putting more weight on them to alleviate the pain in her hind legs. 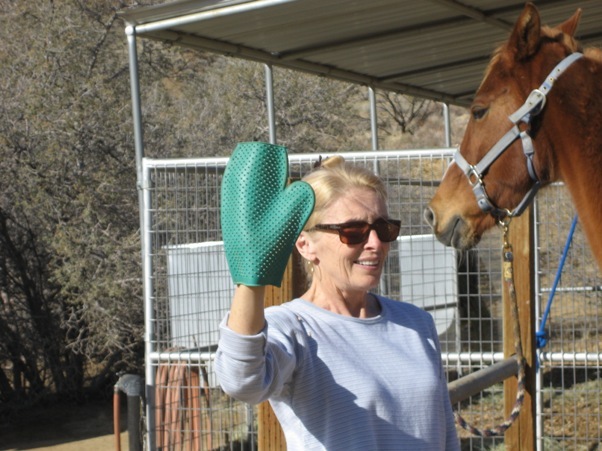 The bute helped—she was now on two grams a day—and she still looked excited and happy to see me, anticipating a chance to walk around while I cleaned and did barn chores. By the time I was considering three butes a day, I had to admit that there was no point in waiting any longer. She would only get worse—in fact one of her front fetlocks was sinking. It was time. My vet arranged everything, including the removal of Prim’s body. As promised, they were unobtrusive and respectful, and their truck was clean—no bloodstains—and empty. Prim wouldn’t have to share space with other dead animals. I told my vet I wanted to stay with Prim until I knew she was gone, but after that, I wanted to leave. Nodding, she told me what she planned to do, and what would happen after that. She also told me that once she gave Prim the final shot, I would have to stand clear because she would simply collapse—all nine hundred pounds of her. First she sedated Prim. Tranquilizers put her in a happy twilight phase where the position of her ears always made her look drunk. In addition to giving her a few minutes of pain-free comfort, tranquilizers also help the procedure go more quickly and smoothly. Then the vet gave her a final shot of pentobarbital. A fitting tribute. I miss her. 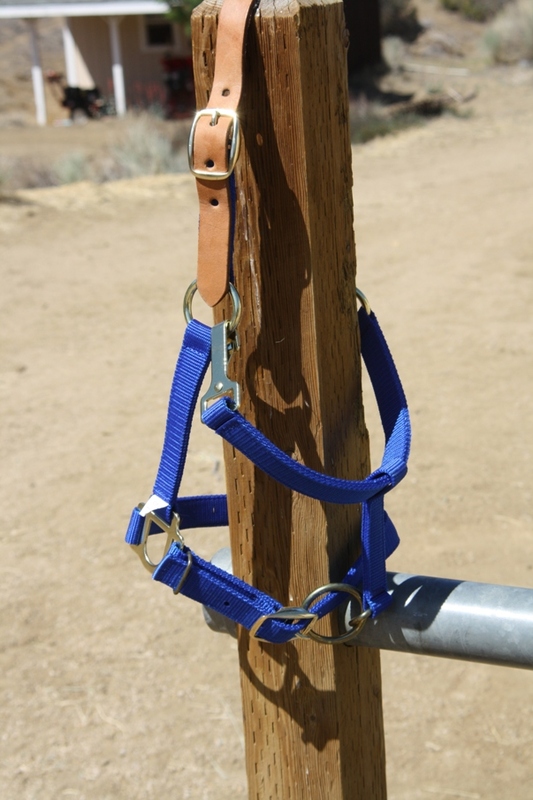 Breakaway halters are useful if you have a horse that has to wear a halter all the time. The most common reason is because the horse bites. If he’s already haltered, you can snap a leadrope directly to the halter while standing at his shoulder, where you can deflect a nip. I also use a breakaway halter on Prim, my old mare with the dropped fetlocks, when I turn her out to self-exercise. 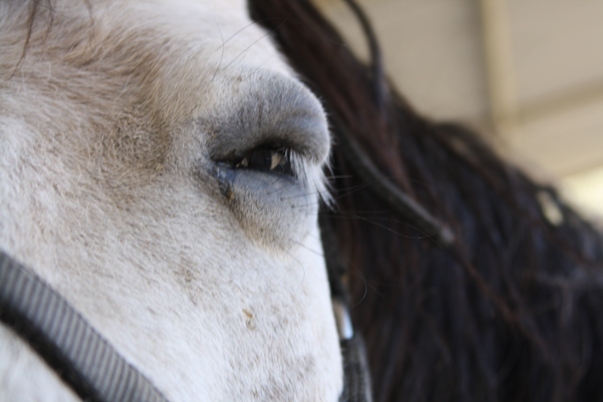 (She never lets Gunsmoke out of her sight, which is the reason I turn him out in the arena first.) When I let go of her leadrope (a very short one, called a “catch rope”) and cluck, she gallops towards him and they circle the arena a couple of times, Gunner on the inside, Prim on the outside. It’s short, so she can’t step on it and trip, or get it snagged on something. Even if she did manage to do that, her breakaway halter would do its job and break. Unlike Gunner, she doesn’t wear it all the time—just when I turn her out. A forgiving horse is one that, for example, sees a raven fly out of a bush right in front of him, gets frightened, and shies. 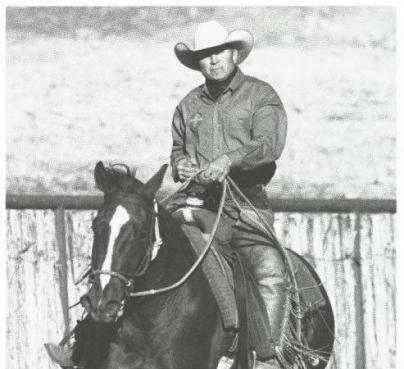 But instead of staying scared and running back home, out of control, your horse forgets about the raven and remembers that you taught him to obey you instead of his natural instincts. He’s willing to put his trust in you again. But there’s another kind of forgiving horse. This horse has often been unfairly reprimanded or mistreated, usually because of ignorance on his owner’s part—and he forgives her for it. The cat who nips at your hand is similar to the horse who nips at (air bites) your hand, and you can use the same methods to stop the behavior. Keep your hands away from his face; never allow him to play with your hands; and never, ever, physically punish him. As Tuesday’s photo illustrated, horses can do things that look very strange—even frightening—to their two-legged owners. The horse in the photo was yawning, but some owners will never see it happen. That’s because most horses very seldom yawn. The first time you see the behavior, you might mistake it for a seizure of some kind. 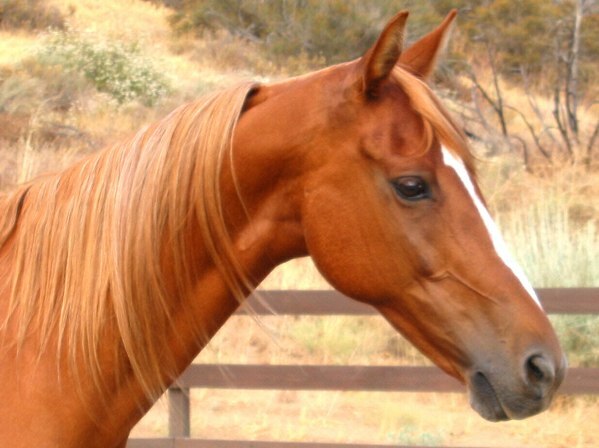 The horse’s eyes roll back, his ears flop, and he opens his mouth wide enough to let his tongue hang out. The first time I saw a horse do that I was poised to run to the house and scream at my husband to “call the veterinarian!” Luckily the horse closed his mouth, chewed a little, and wandered off. 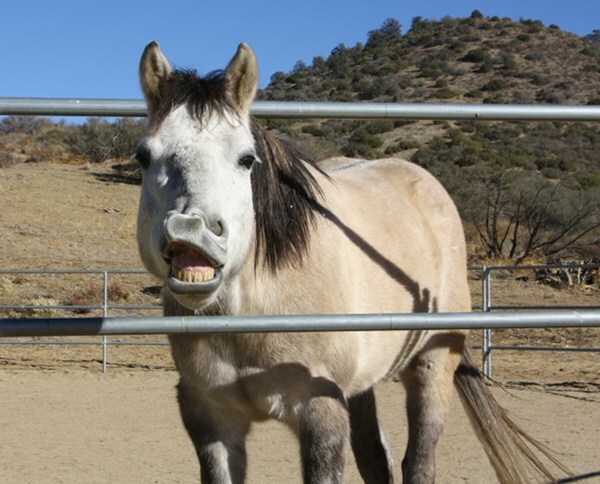 Gunsmoke exhibiting a flehmen response.